GAME Engineering Ltd manufactures their high quality industrial Diverter Valves to the highest current engineering standards and practice. The Diverter Valves are built in either mild or stainless steel or plastics: with a paint, natural or galvanized finish. 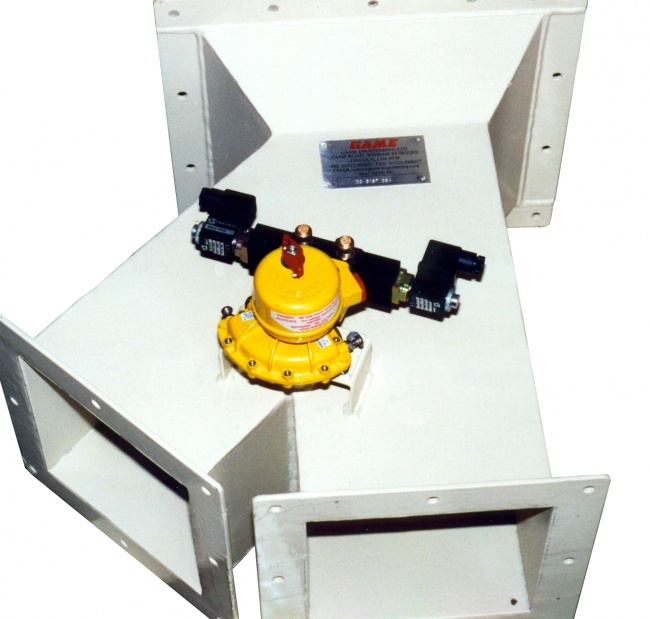 The compact design of the actuator arrangement ensures tidy accessible installation. Double acting rams are fitted as an alternative to actuators with equal efficiency, 2-way and 3-way configurations are available with 45 degree & 90 degree standard options (alternative models available dependent upon the application). Flap or sealed internal bucket spout arrangement, ensures minimal contamination and residue. Inlet and outlet dimensional variations can be accommodated. Hand or chain operated options are available with or without micro-switch indication. We also manufacture special purpose valves and fittings to suit customers’ particular requirements – bulk bin outlets for example. Our Diverter Valves are designed to handle a variety of different materials in many environments and the materials of construction and finish can be varied to suit customer requirements. Main Body: constructed from either mild steel or stainless steel, with a paint, natural or galvanised finish. Installation: valves can be installed in most attitudes. Ensure that all mating surfaces are flat. A gasket material (such as rubber or a silicone sealant should be used to take up irregularities with uneven surfaces). Valves are tested at the works and the clearance between side plates and the valve plate is set. Pneumatic Operation: valves are fitted with Kinetrol 1/4 turn actuators fitted with standard limit switches, these are in turn coupled to external solenoids. The ports to the valve and actuators are pre-piped with the valve being piped to the outside for pneumatic connection. The air supply should be approximately 6.2 bar and free from moisture. Maintenance: after prolonged use wear will take place on valve plate. If plate has worn excessively then valve plate will require renewing. Periodic cleaning of the pneumatic parts is recommended and the inspection for excessive wear. Timing between inspections is dependent on service conditions. Rack & Pinion – fitted with hand-wheel or chain-wheel. Pneumatic – either single or twin cylinder according to size and fitted with solenoid valve and spring return. The open and closed indicator switch is ready wired and piped for connection. 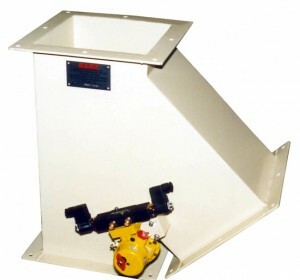 Motorised – similar to pneumatic but operated by electric motor with open & closed indicator/ limit switches and ready wired for connecting to external supply. GAME bucket type diverter valves comprise of a body with integral inlet spigot, front and rear cover plates, the bucket with shafts and pneumatics. The bucket is operated by a pneumatic cylinder connected via the actuator arm to one of the shafts. The shafts run on flange type bearings. 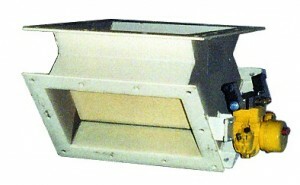 The covers can be removed to allow the bucket to be lowered and removed for inspection or replacement. Valve should not be used for any other purpose than those stated, without prior consultation with GAME technical department. Bucket type diverter valves should be installed in a vertical attitude.